Are you suffering from an Ankle Condition? The ankle joint is a very important area of the body which enables us to participate in various activities of daily living. The ankle joint helps us to walk, jump, hold our body weight and keep the legs/torso stable. 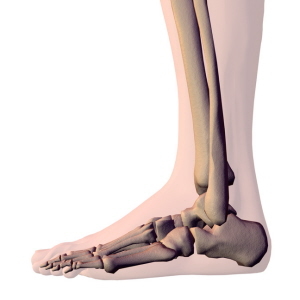 The ankle joint consists of the tibia (shin bone), fibula, and five tarsal bones. 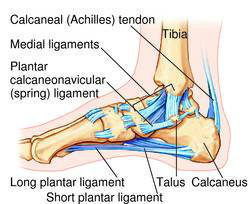 Many problems can arise from the ankle joint/area including ankle twists, fractures, shin splints, achilles tendonitis, and compaction of the tarsal bones. What are my treatment options for an Ankle Condition? Chiropractic & Alternative Options Offered: Dr. Luciano Di Loreto (Chiropractor) and his team of health therapists can help you rehabilitate your muscles after an ankle/leg injury via both active exercises as well as passive treatments. Our extensive passive treatments include laser therapy (healing), ultrasound (healing), electrotherapy (pain), hot/cold therapy and soft tissue therapy. Registered massage therapy, physical therapy, foot care and nutrition may also be incorporated as part of plan of management. Treatments are usually booked two to three times per week for six to eight weeks. Full recovery involves varies.